Board Votes to Postpone SDO Closure: Will the Community Rally? After 67 seasons, the Connecticut Opera failed to adapt. When they were forced to close up shop in 2009, hundreds of patrons and artists, like me, were left with questions that would go unanswered. In February of 2009, glowing in our tuxes and gowns after a recent art-song recital in Hartford, there came a swift and painful blow: a sudden announcement that all operations would cease in two weeks. No prior warning, no communication with the employees and, more importantly, zero communication with the community. Over the years, the leadership at CT Opera had just lost touch. In the arts, if we stop looking for innovation and ideas in the community, we’re done for. There was a sense of urgency during an unscheduled San Diego Opera board meeting yesterday. The divided assembly seems to have been rooted on two sides: the 33 board members who chose to shut the opera down two weeks ago and the 25 who were either opposed to the closure or who weren’t informed of the motion to vote. Someone familiar with the matter said that the deliberation took several hours before anyone stirred from the opera’s offices in downtown San Diego, but not much was accomplished. They did, however, agree to postpone the decision to close for two weeks. A brief sigh of relief for advocates looking to save the 49 year old company. Emotion has been pouring out among opera supporters world-wide who have witnessed the startling ripple effect created by the controversial closure (set to previously transpire on April 14th following the final performance of Don Quixote). Bitter sentiment, disbelief, accusations and questions for SD Opera leadership have emerged on an alarming level. OperaPulse has had its questions as well. 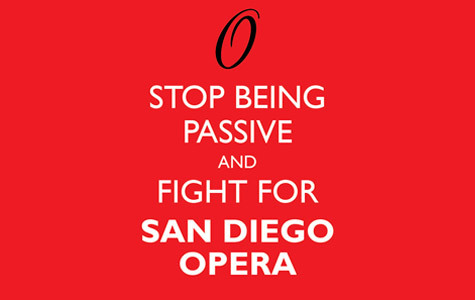 In a recent editorial, we were interested in sending a message to the San Diego Opera leadership as well as the community. We feel that the void in the arts community by shutting down a $15 million, internationally-renowned company would manifest and would drastically affect every other cultural institution in the city starting with the San Diego Symphony, which relies on yearly contracts with the opera. We stressed that such a company, one with the financial means and international clout, should be leading the way in adapting the arts for the community. The evolution of opera is not to be taken lightly as it is mandatory, for all involved, to embrace in order to ensure large-scale prosperity. Companies on any level, from $330 million to a shoe-string budget, specializing in grand or intimate opera all need to do one thing: make it a priority to connect and listen to their community. The world doesn’t want them to change the product, they just need to see a change in presentation. “Music, theatre, dance, painting and sculpture, poetry — are under pressure everywhere as the broader categories of entertainment sort themselves out in this roiling electronic era. How can such medieval handcrafts even survive? Opera has been evolving ever since the dawn of its creation. It may take decades, but it’s gone from small venues hardly big enough for a chamber orchestra, a pair of singers and a few gold-laced seats for the rich, to grand halls of the monarchs, to taverns of Vienna, and to the cave-like prosceniums of the west. One thing that all of these eras have in common is that they were almost always supported by the wealthy. This probably will never change, and why should it? Afterall, opera has been dubbed the highest artistic form, which inherently carries a larger than average price tag due to an unmatched collaborative power in the arts. Passionate angel investors are a driving force behind successful large companies. On-the-other-hand, filling the seats is very important, so a universal effort to shape performance for the audience is crucial. If ticket sales are dwindling for a large opera house, could it be that the era of the grand stage experience is coming to an end? When did the notion of being operatic (AKA – grand, larger than life) become based solely on a physical scale? Transcendence isn’t tangible. We can reach audiences on many levels. Perhaps the audience in and of itself will change inside the performance hall. Outside of the performance space it has. New technology has made everything instantaneous and in-your-face. Each day over the past 20-30 years, culture has become accustomed to an intimacy never before witnessed; from intense surround sound to seeing the pores on Brad Pitt’s HD face. For audience gain, large opera companies have a tough challenge in defying weathered techniques when creating grand opera. It’s important they strive to listen to the interests of the community and seek out new audiences. There is no wrong place to reach out to them, but some places are more promising than others. Digitally, opera is pathetic. The art form hasn’t even come close to catching up to the rest of the world electronically. The average 30 year old isn’t reading many newspapers or magazines anymore. Instead, they’re using the internet to find out about the world. Much time and effort should be focused here – targeted online marketing. Ironically, we started a target campaign for San Diego Opera’s production of Murder in the Cathedral last year to show them the power of proper online content. This small offering was put together to amplify the opera’s digital footprint. Our goal was to show the direction opera should go digitally and, while it was well received by a handful of employees, the content conveniently wasn’t included in the overall marketing plan for 2014. Creating content that appeals to the average online community member, not the average artistically educated mind, will build new audiences. They’ve lost touch. Does leadership at San Diego Opera really know its community? Do they even want to know, or are they shutting out thousands by sticking to a failing agenda set up nearly 50 years ago? 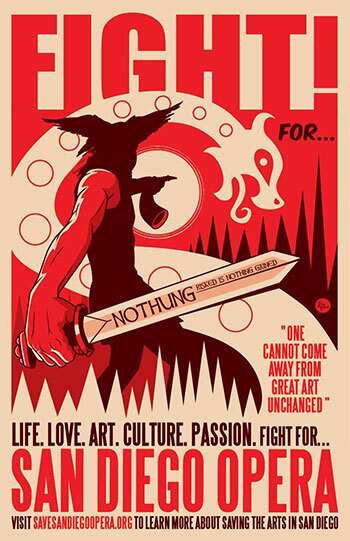 Maintaining such an agenda has jeopardized the livelihood of hundreds of artists. Moreover, thousands of eager yet uninspired minds will go ignored. The reigns of any great stagecoach should know when to be passed once the worn and weathered hands of which progress is controlled forget the relationship between horse and hand. “Staff sources frustrated with Ian Campbell’s management style are conflicted when describing the man who, 30 years ago, took a financially-strapped operation and built a world-class opera company. If you haven’t signed it, please do so here. As of late Monday night, the movement has made an impact. There is a two week deadline after the final performance on April 14 to show our support. Help us change the minds of a board that have a chance to make things right. As John Menier, producer at UCSD-TV, is so passionately demonstrating, we too believe “the arts are worth fighting for” because new and old audiences alike are desperate to be inspired. And they deserve the best effort from those with the power to make things happen.